It has been a devastating week for me. In fact, a dark week for us Singaporeans. 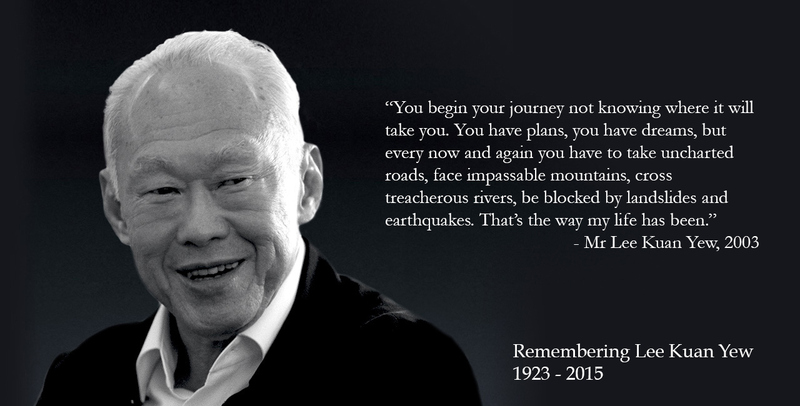 The lost of our founding father, Mr Lee Kuan Yew has brought us great grief. He was a well respected man whom led to the success of Singapore, to where we are now. Mr Lee, sometimes addressed by many as LKY, is often credited for his outstanding leadership, fatherly values and his upmost respect for asian values. He is one who remembers his roots, stays adamant to them and ensures that Singapore remains cultured and never forget what made us who were were today. I credit a large part of my growing up to him and how he had influence over my life as well as many of my peers. I always believe that the society that he moulds would revolve around core sectors that would enable the country to prosper. Inevitably, for a country this small with little resources, those were the immediate steps he had to take. But as the country progresses towards prosperity, we soon realised the lack of culture and art in our society. There were then efforts made to slowly encourage and push for arts and design. It is then, that I transit into the creative industry and begin my journey as a creative. Today, I want to thank Mr. Lee Kuan Yew for shaping Singapore to a safe society where we become the ideal Asian hub for most MNCs. Hence, opening doors for us to work in many of these outstanding companies and agencies. Rest in peace, Sir. Lee Kuan Yew. You will always be fondly remembered.